One of the most frequently asked questions by creative business owners is “How do I get my page/products/business noticed on Facebook”. And it’s a question heard most loudly following a change by Facebook in the way they rank posts and therefore how viewable a pages posts are on newsfeeds. While wanting to ensure the maximum number of people can view our page posts is understandable (and lets face it – pretty crucial to getting your word out! ), I wonder, do we focus too much on how to make people see us rather than making sure we provide great content that best represents our business/products to the world? Because the fact is, if we’re a truly interesting page with relevant posts that engage our ‘people’ they’re going to be itching to share, to spread the word about how wonderful our products and services are, and generally be your best cheerleaders! 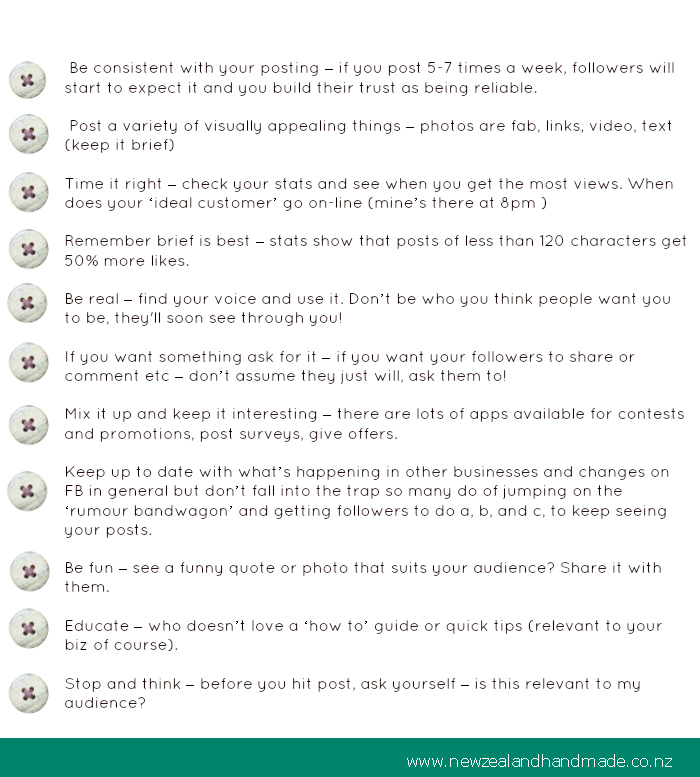 Shares, comments and likes on Facebook are GOLD, and to get these, great posts are the KEY. So HOW? I hear you ask. I suggest this … First identify your ideal customer – not literally a real person (or maybe it is!) – but the person you see as your ideal customer (yes, I know you want to sell to absolutely everyone regardless of gender, age, and income!). But let’s break it down for a minute … I design, make and sell jewellery … my imaginary ideal customer is actually based on a real customer of mine (;)) , she’s a creative person herself, she’s passionate about supporting makers, she loves colour, she has a family and so understands my time constraints, she appreciates quality and workmanship, she purchases from me for different reasons – friends birthdays, family at Christmas, and most often for herself, she loves extra touches such as gift wrapping, is a great communicator, always leaves feedback/reviews, and is quick to recommend me to others/comment on posts that take her fancy/share my news etc. She is a FB/Twitter/Pinterest follower and subscribes to my newsletter. Man she’s awesome! Is your ideal customer still with you? Great! Bet she’s also bought along her friends and family!